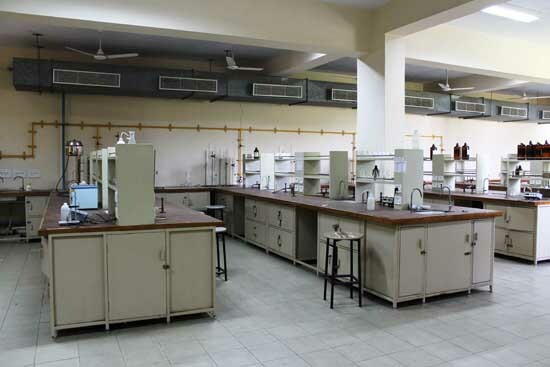 The Department of Chemistry at JUET Guna has two well-developed laboratories equipped with modern facilities and is actively involved in teaching the fundamental applied chemistry courses for the B.Tech. and Diploma students of the Chemical, Civil and Mechanical Engineering departments. The faculty of the department also teach specialized elective subjects to the final year B.Tech. students such as polymer engineering, pharmaceutical engineering & solid waste management etc. The department provides a strong research platform to the aspiring students for pursuing their doctoral degree program. Guidance is also provided for minor experimental research projects done by the students of the chemical engineering department. The faculty of the chemistry department is comprised of five highly qualified faculty with Ph.D. degrees from the best institutes in India. They are committed to the cause of bringing and cultivating the young bright minds and preparing them to face the challenge of the chemical and allied industries. The department also offers a degree program and Doctor of Philosophy in Chemistry. The department of Chemistry offers the doctor of philosophy program to the bright & meritorius scholars. The first Ph.D. student successfully completed the program and was awarded Doctor of Philosophy in Chemistry in 2011. Currently five full-time and one part-time Ph.D. scholars are pursuing their research under the guidance of Chemistry faculty with close association of Chemical engineering department. The main research areas of the department are synthesis of new polymers, catalysis, natural products, and quality of underground water, biogas, bioremediation (Arsenic Contaminated Groundwater), solar energy, novel surfactants and oleo-chemicals. Adminstratively, the Chemistry department is attached with the Chemical Engineering department.